VINTAGE COSTUME ANTIQUE ESTATE JEWELRY BRACELETS! 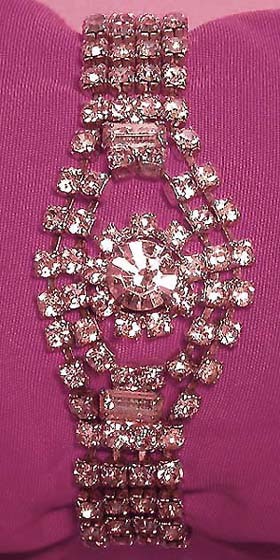 Four Strand Clear Crystal Rhinestone Vintage Antique Estate Bracelet For Weddings, Proms, Pageants And Parties! 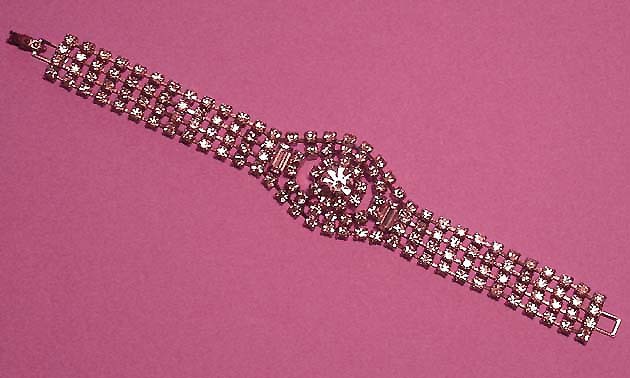 Item #BR16816 - Four Strand Clear Crystal Rhinestone Vintage Antique Estate Bracelet. Four strands of gorgeous sparkling clear crystal rhinestones lining up so smartly and are so flexible that you want to caress them over and over. The oval dome has a heavily faceted 3/8" glittering crystal rhinestone adorned by smaller rounds for more prominent appeal. It is then further surrounded by more round stones with a 3/8" clear glitzy baguette on each side. The dome measures 1" by 1 1/2". All prong set on shining silver tone. A continuous gorgeous band of elegance waiting to drape around your wrist. It closes with a foldover clasp. Excellent Condition. US$98.00. SOLD.